That Castroite Cubans not only influence the relevant power centers in socialist-destroyed Venezuela (i.e. military & secret police,) but staff and control these power centers, must be old- hat to Townhall readers by now. And that was almost five years ago! Since then conditions have only worsened (if such a thing is possible.) And unfortunately history proves that Castro-Commies cannot be defeated with “referendums,” international “tsk, tsks,” and finger-wagging….sorry. In fact, history shows that the Castroite curse can only be extinguished with a “‘heapin helping” (not of “Hillbilly hospitality”) but of its own medicine. Take the case of Soviet-Cuban satrap Salvador Allende in Chile. Oh, I know, I know, the Fake News Media, Fake Academia, etc. all shriek and wail that the nefariously “right-wing” CIA toppled Salvador Allende! What a joke. In fact, the proof of the (historically pinko-riddled) CIA’s non-involvement in the ouster of Salvador Allende and his cabal of Soviet/Cuban stooges (which quickly led to Chile’s path to freedom and prosperity) is easily proven by a simple fact: it succeeded—and brilliantly! "We had nothing to do with it," Kissinger told Nixon over the phone on June 1973 after an earlier (and botched) coup attempt against Allende. “It came as a complete surprise to us." Added Assistant Secretary of State Jack Rush. “My firm instructions to everybody on the staff are that we are not to involve ourselves in any way,” reported U.S. ambassador (to Chile) Nathaniel Davis, who kept hearing coup rumors from his Chilean contacts. "We didn't do it,” replied Kissinger. "Stalin was a banner of creativity, of humanism and an edifying picture of peace and heroism!" declared Salvador Allende during a eulogy in 1953. "Our father Stalin has died but in remembering his example our affection for him will cause our arms to grow strong towards building a grand tomorrow—to insure a future in memory of his grand example!" More importantly, Pinochet and his plotters were scrupulous in keeping U.S. State Dept. and CIA “nation-builders” and other such egghead busybodies out of their plotting loop. 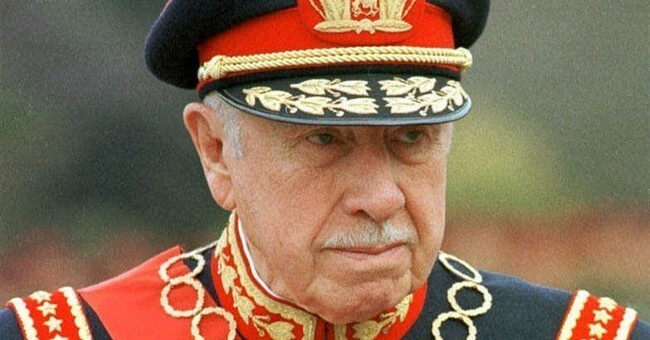 (As mentioned, this probably explains Pinochet’s success.) Then two years after the coup they invited free-market economist Milton Freidman and his “Chicago Boys” over for some economic tutelage. And as mentioned: today Chile is probably freest and richest nation in Latin America. “Me and my staff were all Fidelistas” (Robert Reynolds, the CIA’s Caribbean Desk chief from 1957 to 1960). “Everyone in the CIA and everyone at State was pro-Castro, except [Republican] ambassador Earl Smith” (Robert Weicha, CIA operative in Santiago Cuba). “Don’t worry. We’ve infiltrated Castro’s guerrilla group in the Sierra Mountains. The Castro brothers and Ernesto “Che” Guevara have no affiliations with any Communists whatsoever” (Havana CIA station chief Jim Noel, 1958). In fact, some of those CIA men are still fuming over my expose’ of their “shrewdness.” Writing in the prestigious international Journal of Intelligence and CounterIntelligence (Volume 27, Issue 2, 2014) the man who served as the CIA’s station chief in Santiago Cuba (the area where KGB-managed Raul Castro operated) from 1957-60 Robert D. Chapman bashes my book The Longest Romance pretty severely. But without specifically refuting any of my (highly-embarrassing to him) documentation or quotes.